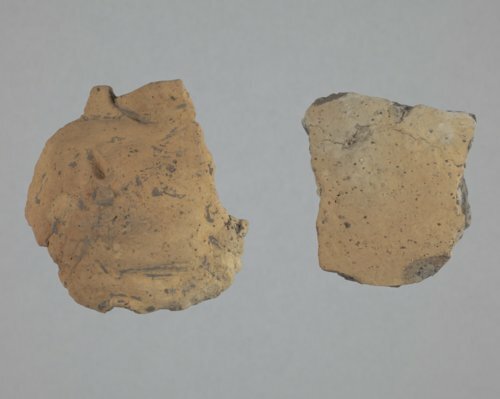 These two thick ceramic vessel sherds were collected from the Wullscheleger site in Marshall County and donated to the Kansas Historical Society in 1960 and 1961. The body sherd on the left has sand tempering. The rim and body sherd on the right has no visible temper, but does have hematite inclusions. The rim may have slumped somewhat before or during firing. A tool was used on its interior to puncture the clay.